(Kitco News) – World stock markets were mostly higher overnight, in the wake of an upbeat assessment of the U.S. economy from the Federal Reserve on Wednesday. U.S. stock indexes are pointed toward slightly lower openings when the U.S. day session begins. U.S. stock indexes are near their recent record highs. 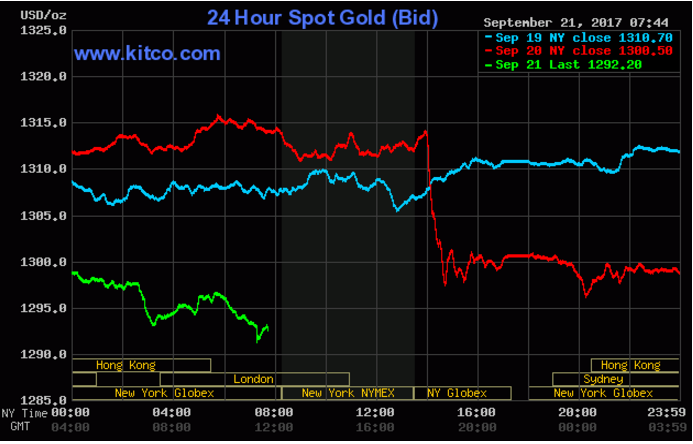 Gold prices are solidly lower and have hit a three-week low following the hawkish Fed meeting this week and the "risk-on" trader and investor attitudes at present. World markets are still digesting the Federal Reserve's Open Market Committee (FOMC) meeting that ended Wednesday with Fed Chair Janet Yellen's press conference. The Fed did not raise interest rates but did announce that in October it will start reducing its big balance sheet of U.S. securities. The aforementioned moves were not surprising. What is surprising was the Fed's upbeat tone on the U.S. economy despite two major hurricanes that just hit the U.S. mainland. A December interest rate hike remains on the table and the Fed also wants to raise interest rates three times in 2018. The U.S. dollar rallied strongly on the hawkish Fed stance, while U.S. Treasury prices sold off. U.S. stock indexes ended the day mixed Wednesday. In overnight news, Standard & Poors lowered China's sovereign credit rating due to that country's debt levels. It was the first S&P downgrade of China's credit rating since 1999. The Bank of Japan Thursday left its monetary policy unchanged at the regular BOJ meeting. No changes in policy were expected. The key outside markets on Thursday morning see the U.S. dollar index slightly weaker after Wednesday's strong gains. Meantime, Nymex crude oil futures are weaker this morning. The oil bulls have the slight near-term technical advantage as prices hover just above $50 a barrel. U.S. economic data due for release Thursday includes the weekly jobless claims report, the Philadelphia Fed business survey, the monthly house price index, and leading economic indicators.